It would be difficult to find a person in the entire free world that doesn’t recognize the golden M of the McDonalds Company. Founded in 1940 as yet another drive-through restaurant, McDonalds has come to dominate the world of fast food. Their distinctive yellow arches can be seen throughout the world and their customers’ number in the billions. McDonalds is, without a doubt, the most popular fast food restaurant in America if not the world and it shows no signs of slowing down. 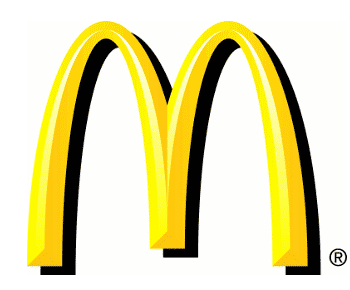 One important factor that has always worked in McDonalds favor is the simple, but distinctive, look of their logo. It’s hard to imagine going down any road in the United States and not seeing the famed golden arches nearby. The rise of McDonalds has been nothing short of incredible and their logo can be seen in nearly 200 countries. Anyone who seeks to market their own brand should pay attention to the success story of McDonald’s log. Back in the very beginning, McDonalds had a very different logo and mascot. Their original logo portrayed a cartoonish chef named Speedee, who served to symbolize their great food and fast service. The logo was less than popular and so, in 1953, was replaced by the much more well-known logo of the golden arches. In 1953 when the first franchise location of McDonalds was being built, the architect considered adding golden arches as doorways to make the restaurant more distinct. In the end he decided not to but, in the fullness of time, the arches became the well-known logo for McDonalds. There is some very important symbolism that goes along with the famed “M.” The gold color of the arches was meant to symbolize to those who were interested in opening their own restaurant that owning a McDonalds was akin to opening a gold mine. The arches were also meant to symbolize stability, a place where customers could sit back and relax after a grueling day. The logo of the McDonalds Company is one of the most distinctive in the world. People from across the planet can recognize the golden arches. This kind of brand recognition is vital for a healthy company and McDonalds has it in spades. The logo is only a simple yellow m on a red background and despite this simplicity, McDonalds is one of the most well-known company’s on the planet. The globalization of the McDonalds brand has been nothing short of astronomical. From China to Canada, the McDonalds logo is everywhere. Their success story is one for the ages, and it all boils down to a tiny little BBQ restaurant in the United States. Anyone who seeks to create their own brand recognition should consider the lesson of McDonalds. The golden arches, plain and simple as they are, symbolize one of the most profitable companies in the world. Just because a company is wildly successful, doesn’t mean that their logo has to be overly complex. Sometimes the simplest logos are best.